COLUMBUS, Ohio (CBS/AP) Jailers in a central Ohio county regularly use stun guns to "soften up" inmates who pose no threat, and often use the guns on inmates who are disabled, pregnant or under the influence of drugs or alcohol, the Justice Department said in a federal complaint. Franklin County jailers also use the guns to shock naked and restrained prisoners and to punish inmates for routine rule violations, according to a motion filed Wednesday in an ongoing federal civil rights lawsuit. The complaint said jailers regularly put stun guns in a "drive stun" mode designed to cause continuous pain to someone resisting an officer. "In case after case, deputies tase people, often in the drive stun mode to cause pain, when the person was greatly outnumbered by a team of deputies who were easily able to physically overpower and control the individual," the complaint said. In other cases, jailers are accused of using the guns "to 'soften up' detainees and regularly applying tasers to individuals who do not pose any threat of violence or harm to themselves or others," according to the complaint. The government wants to join a lawsuit against Franklin County brought last summer by a legal rights group on behalf of four current and former inmates. The county prosecutor's office, which represents the jail, has previously asked U.S. District Court Judge Edmund Sargus to dismiss the claims, saying inmates failed to follow jail complaint procedures before filing the lawsuit. The county has also argued that a video of the July 2009 arrest of one of the inmates, Robert Shreve, clearly shows a combative Shreve struggling with deputies and trying to bite one officer. The group that originally brought the lawsuit, independent state agency Legal Rights Service, said video and written reports show that guards have improperly used stun guns several times since at least January 2008 "to inflict pain, fear, corporal punishment and humiliation" when inmates wouldn't obey commands or used profanity or insults. Franklin County Sheriff Jim Karnes, several deputies and jail supervisors are named in the lawsuit. 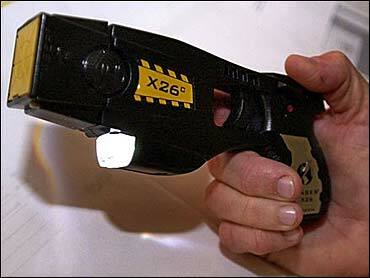 Like many jails and police agencies, Franklin County has rules governing when stun guns can be used. The government's complaint says jail officials wrongly justify the misuse of stun guns after reviewing reports about their use. The complaint also says the county also fails to properly train deputies in the use of the guns and fails to punish deputies whose use of the guns violates the jail's own written policies and "well-established standards of law enforcement." The judge gave Franklin County two weeks to file objections to the U.S. government's bid to join the lawsuit.